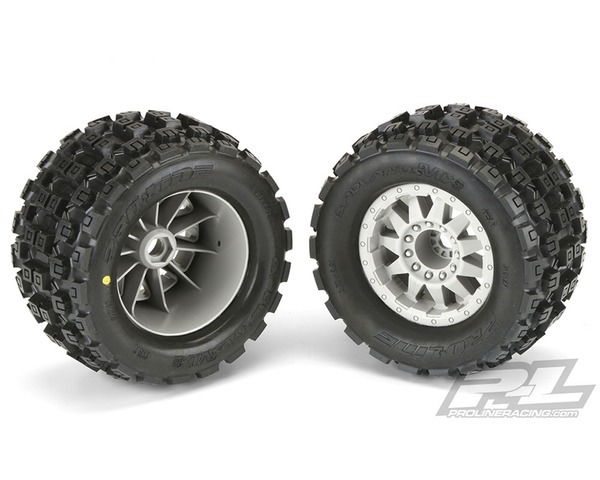 This is a pair of pre-mounted Badlands MX38 Tires. Pro-Line is taking the 3.8" tire game to the next level with the Biggest and Baddest tire ever conceived: the Badlands MX38! Pro-Line Badlands tires are known for having a sweet Motocross inspired tread and the all-new Badlands MX38 tires kick that up a notch with a Bigger and Bolder knobby tread that matches modern MX tire design. The Badlands MX38 is a true All-Terrain tire that will find traction on any surface but is best suited for loose & loamy dirt, mud or grass. Just imagine your truck throwing up huge rooster tails with these awesome looking tires! Compared to the previous Pro-Line Badlands tires, you can expect even better traction, improved wear resistance and enhanced style. We take the guess work out of your glue job by doing the mounting for you so you can spend more time having fun!